With eight patterns printed on 24 pages of beautiful full-color, you’ve always got a 6-Pack project ready to dive into. Each design is shown in five different colorways: Boysenberry, Harvest, Reef,Punch and Cabana! All the projects were created by well-known designers whose work you have seen published in magazines, pattern lines and free Broome Street Patterns (look for the red “Free Pattern” tag on ourProjects page). Pick Up a 6-Pack is the ultimate companion for our Treat 6-Pack pre-cuts. 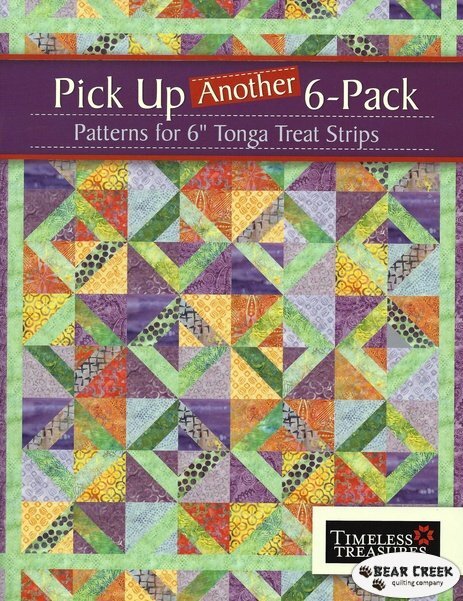 Each 6-Pack contains a beautifully coordinated 20-piece collection of 6″ x WoF Tonga Batik strips. Bonus: Punch, Boysenberry, Harvest and Reef 6-Packs also come with a Geese in Flight free pattern, exclusively available inside the pack!